I’m trying to figure out how we’re suddenly in the middle of busy season! Thursday the Sideman’s and Whertheimer’s stopped by, Friday the Burtons! These three couples are among my dearest, repeat guests and they are here again already … surprise! I’ve been so busy that “season” snuck up on me! Hello …. We were also blind-sided this week by a negative review of one of our properties … and that is the topic of today’s post. This particular property has been under my watch for at least a dozen years. I immediately inventoried the property, then contacted the owner and had an honest discussion about her beloved vacation home. Through the years the property has become “tired.” This has reflected in the number of rentals and the decrease in rental rate. At this point the property desperately needed some TLC. The owner of the property lives locally. In the past when called, she has personally addressed these shortages. But over the years, supplies such as linens, towels and kitchenware, purchased piecemeal, have become a hopeless, disorganized hodge-podge of misfits. However this time, with a little encouragement, the owner relinquished the shopping to me. Once I explained the need for completely new bedding and new kitchen supplies, she put the project into my hands. Yeah and …. Uh-oh! The busiest time of the season and I have a major project! With guests arriving this week, I’m looking at a full weekend of shopping, decorating and instructing cleaners. Oh thank goodness for the cleaners! You may think I’m crazy to jump into such a project at this time of the year … but the last property I was allowed to “dress-up,” immediately increased in desirability and doubled in occupancy, so the time and effort will hopefully pay off for both the owner and Vacation Rentals of the Desert. I will not go into too much detail on what was updated in the kitchen (basically because I still have to work to do), but I will tell you that everything was purchased at Bed, Bath & Beyond with several 20 percent off coupons, and Home Goods. In past posts I have mentioned the boxed sets of white porcelain dishes …. $40 for eight complete place settings. It just doesn’t get any better than that. As for the bedrooms … I was working with a king in the master and two twins in the guest. The master king is low to the floor, yet a newer mattress and box springs. I needed height as well as comfort and beauty to give this room more of an updated look. The walls are a light peach; the décor is traditional with a scattering of antiques. Finding the right bedding was not easy. I would have preferred a comforter and duvet, but found that the local stores had the limited choices of modern, country quilts or solid colored duvets. None of these would work with this room. I finally settled on a thick mattress cover, my favorite white damask sheets, a thick winter blanket and a fluffy printed comforter which matched perfectly with the bedroom décor. The room has completely transformed. 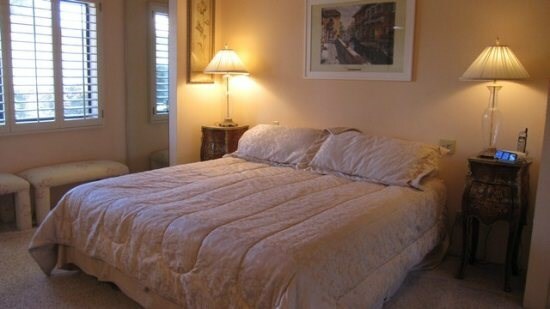 In the twin bedroom I chose the same; mattress cover, white damask sheets and comfy blankets. The spreads again were limited, so I chose white coverlets that can easily fit in the washing machine. With hot water and bleach, the coverlets should stay looking new for at least a couple of seasons. 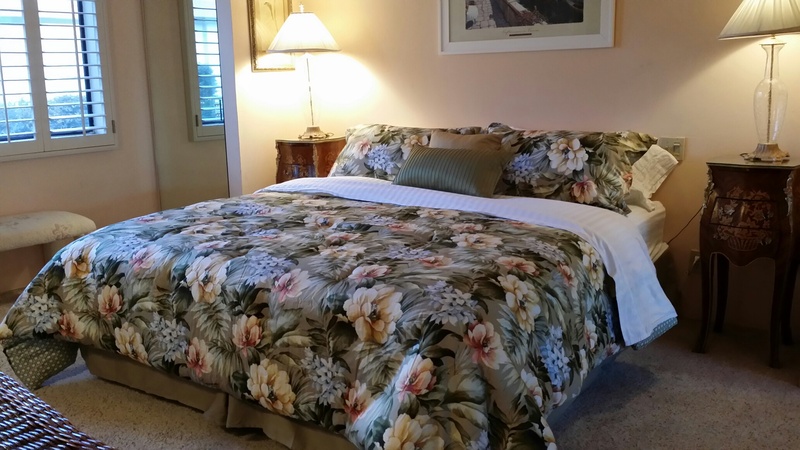 Of course all beds were dressed with new pillows, pillow protectors, shams and decorative throw pillows. The before and after pictures show how just a little change can go a long way. 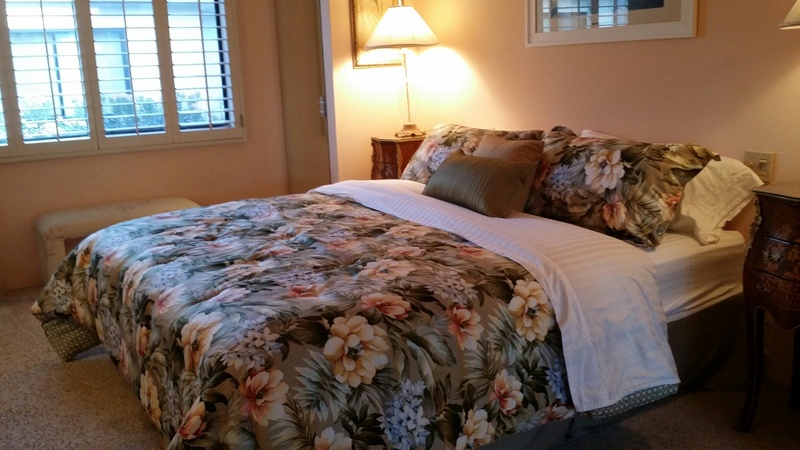 It is vital that a vacation home has an inviting bedroom … this is major in “selling” your property to a potential guest. 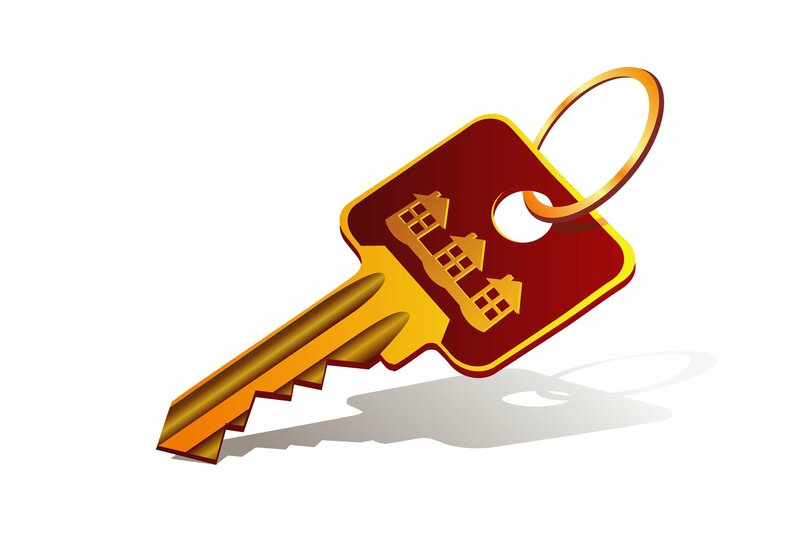 It is also essential that reservationist feel confident in the properties they are representing to a potential client. If an unhappy tenant contacts them with complaints about the property, it is only natural that the reservationist will think twice before recommending the property. I hope this post inspires vacation rental owners to look at their property with a critical eye. I’ve already spent six hours tossing out miss-matched dishes, silverware, bedding and towels. I recommend that this be done at least once a year. That oh so cute cup with a tiny chip … toss it or take it home. I guarantee your guests will not see it as anything more than a chipped cup that they will not use. Happy Sunday everyone and I’ll see you next week. 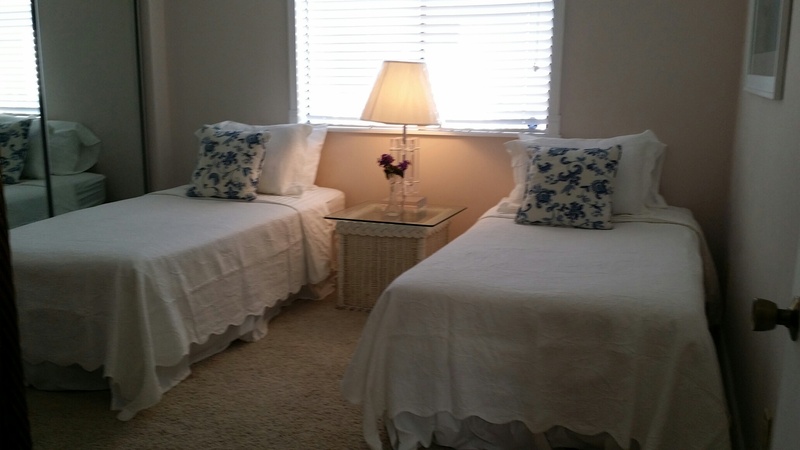 This week we finally got out our Vacation Rentals of the Desert Summer Newsletter. Thank goodness that’s done and in the mail. A surprising amount of work goes into these newsletters. There is so much to say in so little space … review of the past rental season, forecast of the upcoming season, the politics and news of the vacation rental industry and a few helpful money saving tips for our vacation rental owners. In this week’s post I have shared some of the newsletter with you! Internet: These days all vacation rentals should offer Wi-Fi internet. Tablets, iPads, and book readers such as Nooks and Kindles require Wi-Fi since they cannot be plugged into an Ethernet system. Most internet providers will include a Wi-Fi modem … for a fee. Did you know you can save yourself the monthly rental fee by requesting only internet service than purchasing your own Wi-Fi modem? The cost of a modem is about $50 to $60. If you are uncertain about what you need I have found that Best Buy has sales staff that can help you chose the correct modem and explain the simple installation. Save monthly rental fees by purchasing your own Wi-Fi modem. Cable, Internet & Telephones: Many cable services offer a “vacation” hold on their services, predominately in “seasonal” areas. If your vacation rental home is typically unoccupied for months at a time then you may want to see if your cable provider gives you the option to temporarily turn off your services or put them on a vacation hold. You will want to ask if there is a disconnect/re-connect charge or any other restrictions. Reduce or eliminate cable, internet and telephone bills when unoccupied. 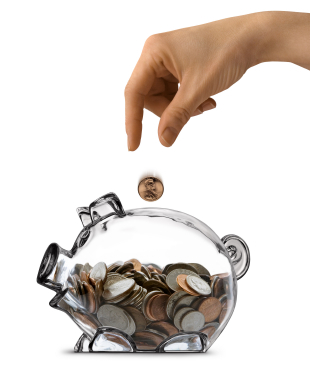 BBQ: A natural gas BBQ is always the least expensive in the long run. Many BBQs come set up for propane, but did you know that many can be easily and inexpensively converted to natural gas. Propane tanks will run out. This always happens in the middle of cooking and your guests will not be happy. Even if you have a spare tank of propane, it is an added hassle for your guest. Many times the guest will change the tank but not let anyone know, so the next guest will be very upset when they change an empty tank for another empty tank. Believe me, I’ve received many angry after hours calls from guests whose dinners have been ruined due to the propane running out in the middle of cooking their dinner. If your property is with a vacation rental company you are looking at a charge for someone to pick-up, exchange, deliver and hook-up a full propane tank. This takes time and usually results in very cranky guests. Would you like to be the one who delivers the propane tank to the guest with the spoiled steaks? It is almost impossible to distinguish a full or empty tank. Also consider the time and cost of repeatedly changing the propane tank. If you have charcoal consider this: beer, cocktails and lighter fluid. To my mind it’s not worth the risk. Propane is better than charcoal but natural gas is your best choice. Save the time and cost of replacing empty propane tanks. Pillow & Mattress Covers: Protect your bedding and your guests … cover, cover, cover! Open mouth sleepers can destroy a pillow in one night! People drink coffee in bed … and breakfast in bed is a wonderful treat … but accidental spills, not so wonderful. It’s pretty gross when changing the sheets to find stains on the pillows or mattress … your imagination will go wild. So your guests go to change the sheets and …. ewww! Short of replacing all pillows between guests, owners should cover bed pillows with quality pillow protectors … even the extra pillows stored in your closet. When purchasing the pillow protectors you want to look for “water resistant,” NOT plastic covers. Plastic is very uncomfortable, hot and noisy. Also a good quality mattress cover will protect and extend the life of your mattress. I suggest washing pillow and mattress protectors between guests AND since you have protection for your pillows purchase quality pillows. You don’t need to spend a fortune on pillows and certainly I would never recommend feather pillows (many people are allergic), but nice, comfortable pillows will be appreciated by your guests. 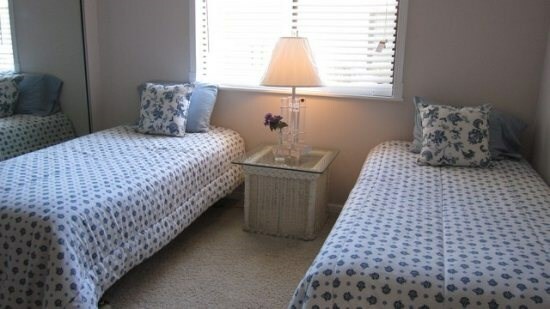 We have noticed that guests are more apt to book a return trip to a property that has comfortable beds. Save the cost of constant pillow replacement. 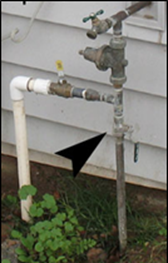 Water Shut-Off Valves: Many homes are equipped with water shut-off valves on the exterior of the property. The valve is installed to turn off only the water inside the home leaving the exterior landscape sprinkler systems to operate normally. Shutting off the water inside your home when unoccupied will give you added protection against leaks and floods. A water shut-off valve can be installed on most properties. A handyman or plumber can assess your property to see if this feature can be added. Save the cost of possible flood damage.